Have you ever thought about making more usable space in your yard, or changing its look entirely? Sunshine Landscapes and our professional partners can help! 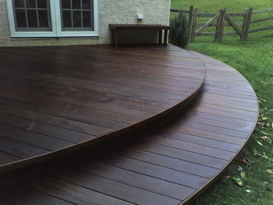 We can design and build a beautiful deck or patio for you, in many different materials including exotic hardwoods, flagstone and travertine. 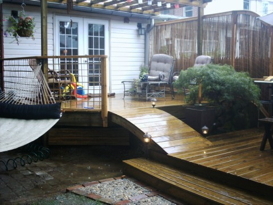 We can replace your pool decking. 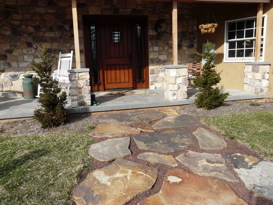 We can also deliver the expensive look of stone at a modest price, through the technique of stamped concrete. 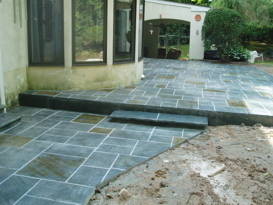 Stamped concrete can be used to simulate flagstones, brick, granite, and even marble. With our hardscaping services, Sunshine Landscapes can build you a deck or patio, steps, walkways, retaining walls, even complete outdoor kitchens or California rooms! And call to ask about our creative poolside solutions, too! See our Stone/Brick/Concrete page for more information.